Fiction – paperback; Harper Perennial; 271 pages; 2007. Salley Vickers’ Miss Garnet’s Angel was my favourite book of 2006 and so it was with some trepidation that I picked up The Other Side of You on a trip to Italy for some much-needed poolside reading: would it live up to expectations? As you will see from the five-stars above, the answer was a resounding yes. The tale is told from two perspectives: Dr David McBride, a psychiatrist, and his patient, Elizabeth Cruikshank, a failed suicide. Essentially it is a story about their relationship and how, over time, trust grows between them. 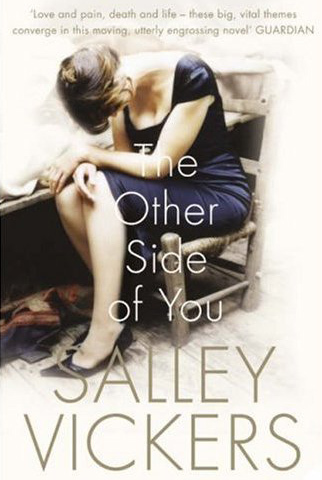 But The Other Side of You also tackles some bigger, yet more subtle, themes, including how the decisions we make impact on the rest of our lives and how we never really know the people we are closest to. During one of his sessions with the normally reticent Elizabeth, David confesses that “there’s no cure for being alive” and that the only thing to do is to “find a way to live”. Having lost a sibling as a child, this is exactly how David has lived his life, keeping the pain buried deep within but sometimes imagining he could “bring him back by willing it”. But it is only when the pair begin to discuss a painting by Caravaggio, The Supper at Emmaus — which depicts the moment when the resurrected Jesus reveals himself to two unsuspecting disciples — that Elizabeth begins to open up and reveal the hidden pain that caused her to attempt to take her own life. Age and disease and death may destroy our physical being but it is other people who get inside us and damage our hearts and minds. My work has occasioned ample examples of this but it was Elizabeth Cruikshank who really made me understand it. […] That long winter afternoon, which grew into evening, while I sat with Elizabeth Cruikshank and she told me her story, I abandoned all the accepted methods of working. What follows is a riveting tale about a tragic love affair, which swings between London and Rome, so beautifully and exquisitely told (by Vickers) that the reader must give up all hope of putting the book down. In fact, I read it in one sitting and by the end of the marathon reading session — some 270 odd pages — I felt utterly devastated. The story lingered in my mind for days and weeks afterwards, but its aftermath felt so “raw” I could not bear to review the book, knowing I could never do it justice. Even now, I realise how meaningless this review sounds compared to the beauty, wisdom and intelligence of Vickers’ prose, where every page has at least one sentence — or paragraph — that truly resonates. In my humble opinion, I think this is a remarkable, utterly engrossing book that cannot fail to move any reader, no matter how hardened they might be to the myriad emotions associated with art, death, life, love and loss. I cried buckets when I got to the end, and I rather suspect you might too. Glad to see you loved this one too. I think I own her entire backlist – jut have to stat reading them! Good plane reading you think? Heather, oh, I had forgotten I’d sent you that. Out of all the Vickers’s books, Instances of the Number 3 is my least favourite. I have her Mr Golightly’s Holiday in my TBR pile, so am tempted to dig it out now. Nutmeg, perfect plane reading material. But you might want to make sure you take some tissues with you. Do you mind sobbing in public? As an avid fan of literature, I’m always looking for new authors to try. Lately I’ve been going through Reading Matters to find authors that I might like. First I read “A Long, Long Way” by Sebastian Barry which has a strong review in Reading Matters as well as in several other places. That book turned out to be a fine read, and now Sebastian Barry is on my short list of authors I want to read more of. Next I decided to try an author who I had not read any reviews of before but was strongly recommended by Reading Matters. There was one author who had two books on the Reading Matters best of year lists. This author was Salley Vickers. I decided to read “Another Side of You”.. In this book, the author has a male narrator. This strategy is difficult for a female writer, because every sentence, every clause, every word has to reflect the gender of the narrator. I must say that many times when the narrator mentioned Olivia, I first thought it was “her” roommate rather than “his” wife. This problem was somewhat exasperated, because as part of the plot, the narrator does not feel that strongly about his wife. I spent the first 80 or so pages withholding judgment on the book. But then I got completely caught up in the story of Thomas and Elizabeth, and I threw all critical judgment out the window. This is always what happens to me, if a book completely takes me over. I found this novel very compelling and would strongly recommend it. I’ve added Salley Vickers to my short list of authors I will read more of. I also like books that add to my appreciation of creative people, and this book increased my appreciation of the artist Caravaggio.